Dry roast green gram and let it cool completely. You can roast it before hand also. Grind it properly. It will be slightly coarse. Take a pan and heat ghee. Add green gram powder and sauté it for about 2 minutes. Add coconut powder and stir it for 3-4 times. Add cardamom powder, cashew nuts, sugar and mix it properly. Add cream and sauté it for 2-3 times. Switch off the gas stove. You can add other nuts also if you like. Let the mixture cool slightly. 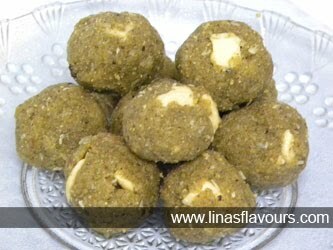 Take about 2 tablespoon of mixture and make ladoos. Let it cool completely. Store it in an air tight container.